One of the more useful riding skills...Well, it’s a lot easier than stopping a horse! Riding a horse is grand but stopping is a question of persuading the beast that it wants to. You supply various mental and physical signals, but none of them have any direct retarding effect. At first sight a bike is more obedient – squeeze the lever and the pads bite the discs. In fact, it’s almost as bad as the horse. The weak link is still there, hidden in your head. I’ve got a diagram a police investigator gave me of a fatal crash involving a VFR Honda. From the marks on the road and witnesses’ estimates of the bike’s speed, the officer showed that the poor chap had ample room to stop. Sadly, he just didn’t. So you might have the best braking technique in the world, but if you can’t produce it when you really need it, you’re stuffed. Which is the argument for ABS: it takes over when you are crapping yourself. The method is simple enough: pull and stamp as hard as you can. But it still needs practice, to build trust and familiarity. Can you bring yourself to make the system work in the first place? Are you familiar with the pulsing and bouncing? Is your body and brain used to the G-force? Inspector Clouseau trained his manservant Cato to attack him at unexpected times. This is the same idea. If you haven’t got ABS, start practising in the dry. 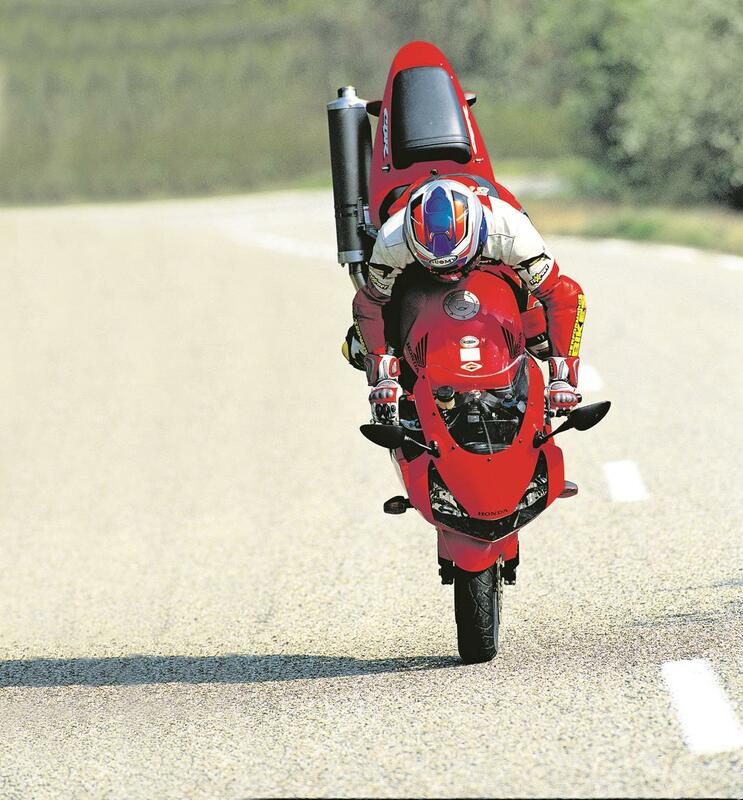 Find an empty road, and stick to the front brake at first. 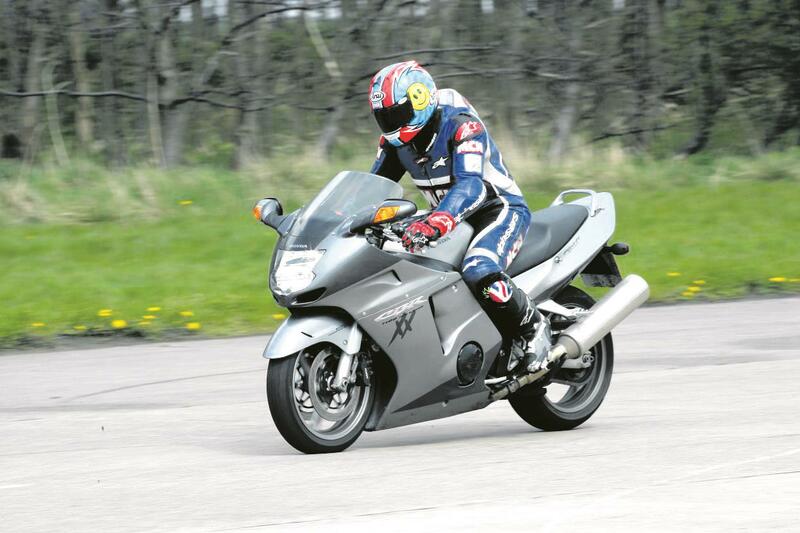 From (say) 60mph, sit up, keep your elbows bent, grip the tank with your knees and squeeze the lever – gently at first, then harder and harder as more weight piles onto the front tyre. Keep your legs and stomach tense and strong; your top half loose and relaxed. As the bike slows, expand your awareness of how near the tyre is to the limit. Just focus on that in relation to the lever feedback. Repeat 10 times (checking for following traffic, of course). Do the same thing again next time you ride. And the next. Repeat, repeat, repeat. You’re turning conscious effort into muscle memory, and it takes ages. When you feel confident, add the back brake. As the weight transfers forwards, it will need less pressure, but until you get to stoppie level it will still help.